Breakfast is the most important meal of the day. Skipping it is the worst thing you can do to yourself. Complex carbs: Sustained energy comesfrom complex carbohydrates. Whole wheat, oats and oat bran in breakfast cereals or any other form should be added. Avoid simple carbs. Stay away from sugary cereals, syrups, pastries and white bread. They are digested quickly and will leave you hungry and tired in a couple of hours. Avoid juices: It's easy to reach for a glass of tetrapack juice when in a hurry. The high sugar content and zero protein or fibre may leave you drained after an hour, and a few inches thicker over the next few months. Avoid meat: It's not a good idea to start your breakfast with cold cuts and sausages on a regular basis. These are high in sodium and preservatives and provide no nutrition. Oats daliya/ upma with curd: This salted treat combines complex carbohydrates with fibre (veggies) and protein (curd). Muesli and soy milk: Muesli contains complex carbohydrates and nuts (good fats), soy milk contains protein and isoflavones (antioxidants). Egg and fruit: Combining egg and fruit gives you the best form of protein, carbohydrate and fibre (both found in fruits). Idli-sambhar: Carbohydrate and protein combination was never so complete! But hard as it can be, try to avoid the coconut chutney. Nuts and fruits: Nuts are high in antioxidants, good fats and proteins. Fruits contain vitamin C, carbohydrates and fibre. Stuffed parantha: Easy to carry, high in complex carbohydrates and fibre (veggies), all natural, and so much better than just coffee and processed biscuits. As winter approaches North India and a pleasant cool breeze starts blowing across the rest of the country, it's time for hot, steaming cups of coffee, tea and soup. Ajay Juneja, 39, Head of Distribution at a private insurance company, swears by his hot cuppa. His day starts with a cup of tea and by the time he hits work he's also had three cups of coffee. Breakfast is the last thing on his mind as he rushes off to office talking on his hands-free device. As Ajay reaches for his fourth coffee, he makes a mental note to get a sugar substitute, since he has gained 8 kg in 18 months and wants to lose some weight by the Christmas vacation. Juneja is just one among hundreds of working professionals who, either due to lack of time, or due to weight-loss hopes, skip breakfast. Sadly, it is the thing that can cause the worst damage to the body's physiological system. Breakfast literally means breaking the fast after a night's sleep. Most people do not eat for up to 12 hours between dinner and breakfast the following day. During this time their energy levels fall. The first meal of the day is important because it supplies the body and brain with the necessary nutrients after a night's sleep. When you skip breakfast, your basal metabolic rate (BMR), the rate at which you burn calories, falls. This means that you will burn less calories through the day than you would have if you had breakfast. Some believe that skipping breakfast helps to lose weight.. In reality, it leads to weight gain. Morning is also the time when nutrient absorption is at its peak. By lunch, with a low BMR, the digestive system will be sluggish (due to coffee and tea on an empty stomach), absorb less, and get overloaded after 17 hours of fasting (assuming you have had dinner at 9 pm the previous night and have unch at 2 pm the next day). This makes absorption even more difficult. Skipping a meal also tends to make us eat more of the next one, adding to the calories. That is not all. When the body is in fasting mode, it goes into fat conservation mode. Yes, you read that right. Hence, since BMR is low, the body conserves fat instead of breaking it down to use it for energy. Lastly, blood sugar levels dip really low, and then surge after 17 hours, when you eat lunch. This causes a spike in blood sugar, leading to fluctuations and finally, a possible pre-diabetic situation. Ever heard someone complain: "I never eat sweets, how come I got diabetic?" Well, now you know. One reason people like Juneja skip breakfast is that they believe it helps to lose weight. But, as explained above, they may end up gaining more weight. Juneja is killing his body's hunger with coffee and sugar merely adding empty calories. Empty calories are calories that have no other nutritional value. A bowl of cereal, a glass of milk and fruits have as many calories and offers the body a lot more nutrition (see Box: Good Breakfast Combos). Breakfast skippers are more malnutritioned than breakfast eaters as they fail to meet two-thirds of the recommended dietary allowances for vitamins and minerals, especially calcium, phosphorus, magnesium, riboflavin, folate and vitamins B12 and A. If you were a child who skipped breakfast, you're also more prone to obesity, diabetes and heart conditions-when kids skip breakfast, they can end up going for as long as 18 hours without food, and this period of semi-starvation can create a lot of physical, intellectual, and behavioural problems that stay till they're adults, often taking a serious turn. Doctors rarely connect skipped-meals over the years to such serious issues. 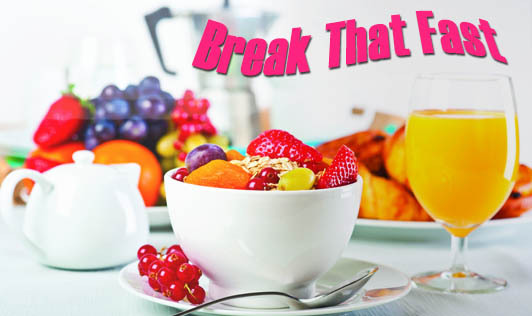 Breakfast boosts your energy to keep you in peak performance throughout the day. So make sure you recharge your energy with a healthy breakfast every day.